Finally, a gaming console exists worthy of Queen Victoria herself! When you think "retrogaming," you probably think back to the gems (and sometimes the dubious stinkers) of the 1980s and 1990s. Reddit user Andrew5785, however, thought back a little earlier - specifically, about 100 years earlier. In order to confer a love of old-school gaming in his nephew, this Redditor took a top-loading NES model and remade it into a steampunk work of art that would look at home in any sci-fi take on Victorian London. Aside from the unconventional casing, the steampunk NES is just a functional console, still chugging away after all these years. Andrew5785 used a variety of parts, including copper, aluminum, plumbing equipment, and rivets in order to give the whole device a distinctly clockwork feel. The whole device exudes a pleasant silvery-copper color scheme with all the traditional NES trappings, including a light to indicate whether the system is on or off, and two controller ports. At present, Andrew5785 does not have any plans to create more of these steampunk novelties, but he did provide a fairly comprehensive procedural if you want to try it yourself. 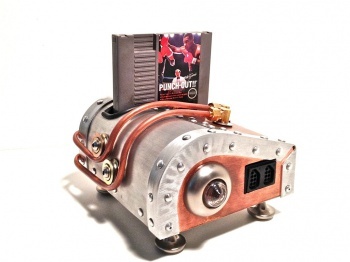 Just think: You, too, could know just what it would feel like to trade a few rounds of Punch-Out!! with Queen Victoria aboard her royal zeppelin equipped with Gatling guns. Alternatively, you could just show it off to your friends and family, but where's the fun in that?